This entry was posted in Every cat has a story and tagged Merry Christmas, Santa by pilch92. Bookmark the permalink. Merry Christmas! Polar Bear, you look like you were trying to eat Santa! I thought he was trying to remove the beard. Merry Christmas! Maybe that’s why- MOL. Merry Christmas! Wow! You all got to meet Santa Paws! Meowy Christmas!! Wow, you all must have been on the “extra nice” list this year to get facetime with Santa! Happy Christmas! You all are so adorable! We loved your card, and it is on our wall. We hope you have a wonderful Christmas. 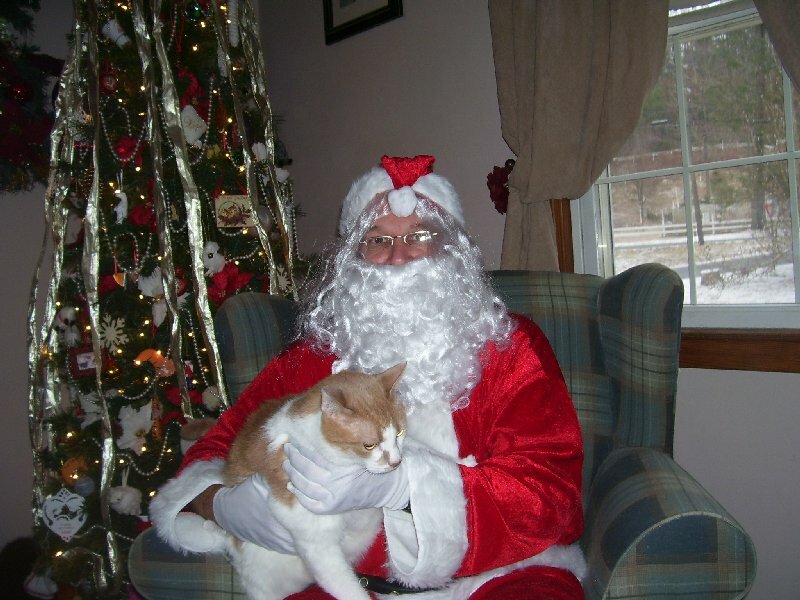 WOW…….when Santa comes to your house he has his hands full (literally) of kitties to say hello to! I hope ALL of you got presents and treats….. Yes, we all got presents and treats- we have a Grammie 🙂 Merry Christmas! Shhhh! You are n’t supposed to tell! Merry Christmas! Thank you and the same to you as well. That must have taken quite a while! Great photos of everyone. Merry Christmas. Thank you Raven-Merry Christmas to you too. It actually only took 15 minutes. I have to round the cats up quickly because the beard/moustache makes my hubbby feel sick. Santa knows how to hold the cats! Wishing you a Merry New York Christmas! Some of them 🙂 And Merry Christmas to you too- I would love a New York Christmas. What fun! Awesome pics of you all with Santa…very cool! Merry Catmas! That is funny 🙂 I am glad you saw the column. Oh what grate pictures of Santa Claus! Thank you- hope you had a nice holiday. Santa comes to our door on the firetruck and delivers candy canes every year in our village. He smells like out neighbor down the street. The first year that mes lived here, he delivered my human brothers’ Christmas Presents! THat is special that he comes on a fire truck. Hope you had a nice holiday. I love how you added musical notes and stars- kisses to you too. Haha. We were thinking the same thing here! Merry Christmas to you, dear friends! We love and appreciate you! MOL. Thank you-we love and appreciate you too. How lucky you all got to meet Santa Claus! Hope you all had a wonderful Christmas. Wonderful pictures of you with ‘Santa’!!!! Hope you all had a wonderful Christmas!